Chef Marylou Tate (right) works with students before the transport of Thanksgiving turkeys to Room In The Inn. 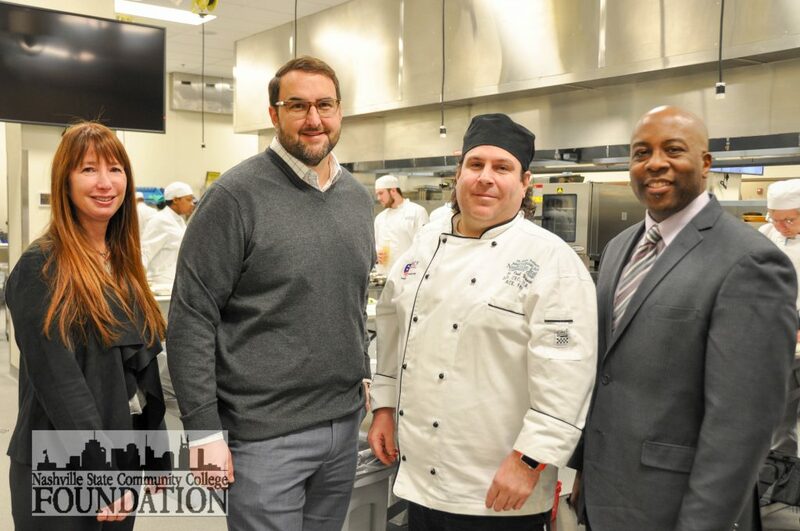 Kim Silverman (NSCC Southeast Campus Director), Stephen Francescon (NSCC Foundation Board member), Chef Paul Brennen (Culinary Arts, Hospitality & Tourism Program Director), and Dr. Terry Brown (NSCC VPAASS) gather to support culinary students. The Nashville State Community College Randy Rayburn School of Culinary Arts, Hospitality & Tourism Management will prepare Thanksgiving turkeys donated by Sysco Foodservice to be served at Room In The Inn’s annual Thanksgiving feast. “This is an excellent opportunity for our culinary students to use the skills they’ve gained in the classroom to make a contribution to the Nashville community during this season of giving,” said Dr. Paul Brennen, Culinary Arts and Hospitality and Tourism Program Director. Students will assist Assistant Professor of Culinary Arts Marylou Tate to prepare the turkeys to be sent to Room In The Inn. “The holidays can be a difficult time for many of us. At Room In The Inn, our goal is to create our own traditions by making the days and weeks around the holidays special. The Thanksgiving turkeys donated from Nashville State’s Culinary Program helps us live out our core value of hospitality and have a nice meal with our community,” said Rachel Hester, Room In The Inn Executive Director.